The Pop In by Casey William Milbrand. Elma, NY May 2015 by Nick Torsell. 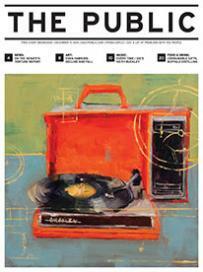 This week’s cover by Roberto Longo is up for auction at Hallwall’s FortyForForty. “Emersonian Tree Mummification (Delaware Park)” by Max Collins is part of a show at Hi-Temp Fabrications. “Time” by Stephanie Dubin is part of the Chroma show at Glow Gallery. Identifying as a punk who just happens to be gay, Steve Ardo is a local freelance illustrator and graphic designer. The following accounts were discovered lurking in the 1888 Buffalo Express Pictoral Yearbook. Fame & Paparazzi by George Afedzi Hughes. Celebrating Art! 2015 is Buffalo Public Schools Annual Student Art Exhibition. Two Helmets by Patrick Foran.